Otto Baer was born in Themar on 12 July 1895. His father was Samuel Baer, b. 28 January 1865 in Marisfeld; his grandfather, Aron Bär (the spelling of Bär changed to ‘ae’ with the move to Themar) was a member of a family that had deep roots in the village of Marisfeld back into the 1700s. Aron, his wife, Sara, and their family had moved to Themar sometime in the late 1860s or early 1870s — we find them on the 1875 Themar Einwohner/Residents List. Samuel would have been ten years of age and have continued his schooling in Themar. See Descendants List of Samuel Bär (1793-1854. Otto’s mother, Lina, née Müller, was born 28 January 1867 in Würzburg, Bavaria and at the moment, this is all we know of her background. Otto Baer was born in 1895 in Themar; his sister, Klara, was born 11 years later in 1906. Both children would have been part of a lively group of young people in Themar, attending the elementary school and receiving Jewish religious education from the Lehrers, and Hugo Friedmann. The Themar Familienregister tells us that Samuel and Lina moved from Themar to Berlin and we can find them in the Berlin Address Books from 1915 on, living at Jablonskistr. 26 (image left) in the Prenzlauer Berg area. Samuel and Lina would have been in their late forties, Otto just shy of 20, and Klara 9 years. Samuel Baer died on 25 December 1916; Lina decided to remain in Berlin and she and Klara, and presumably Otto, continued to live in the same apartment at Jablonskistr. 26. The 1931 Address Book for the Jewish Community of Great-Berlin, includes a listing for both Lina and Otto Baer at Jablonskistr. 26. From then through to the end of 1935, there was an entry for Frau L. Baer at this address; from 1936 until 1939, the entry was for O. Baer, suggesting that his mother had either died or moved into a home for the elderly. The 1925 Berlin Address Book identified O. Baer as a Kfm/Kaufmann/businessman, the 1928 book listed him as a Vertreter or sales representative or agent. In 1936, under the Nazi regime, he is listed as a Handlungsgefhilfe or clerk. We do not know if Otto Baer retained any connections to Themar during the years, or whether he had any contact with Selma Stern, related to him through marriage, when Selma moved to Berlin in 1940. They lived in different parts of Berlin. The only trace of Otto in the official records is his letter of 27 January 1939 to the Themar Registrar, (image at left) confirming that he was adding “Israel’ to his given names as required by the law of August 1938. Otto was 46 years of age when the deportations from Berlin began on 18 October 1941, and his age and ability to work may have spared him from these first deportations. But a year later, when the Nazi Regime accelerated the deportation of Jews from Berlin, he was among those targetted. In early December 1942, he was rounded up from Jablonskistr. 26. On 9 December 1942, he and 993 other Jews were loaded into cattle cars and transported east to Auschwitz. The entry for Otto Baer in the Transportliste for Osttransporte 24 below stated that he was ledig/single and arbeitsfähig/able to work. 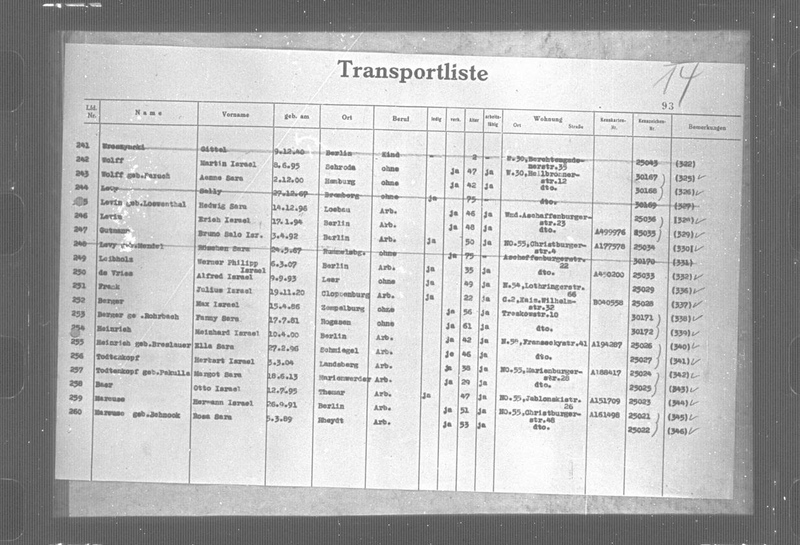 Upon arrival in Auschwitz on 10 December 1942, the SS carried out a selection process. One hundred and thirty-seven (137) men and women — including Otto Baer — were selected for labour and given numbers 26621-26645. For just over two years, Otto Baer managed to stay alive in the brutal conditions of the camp. According to historian Rita Meyhöfer, Only he and one other person on the transport of 9 December 1942 were alive on 27 January 1945. Otto Baer was just short of his 50th birthday. In December 2017, we learned from family members — descendants of Klara Baer, Otto’s sister — that Otto continued to live in East Berlin until his death in 1972. We also learned that Klara survived the war and Holocaust. Her husband, Mordka “Moritz” Mendelwicz did not; he was murdered shortly before the end of the war, March 1945 in Mathausen KZ. Klara’s and Mordka’s son, Siegbert, also survived and he and his mother travelled to New York City from Antwerp in August 1948. Klara and Siegbert Mendelwicz changed their names to Claire and Barry S. Mendell. Claire Mendell died in 1977 and Barry Mendell died in 1991. Jüdische Gemeinde Marisfeld (Kr. Hildburghausen), Matrikel 1768-1938, Koblenz: Bundesarchiv 1958. Jüdische Gemeinde Themar (Kr. Hildburghausen), Matrikel 1820-1938, Koblenz: Bundesarchiv 1958. Themar City Archives, Akt 68-d.